Embodied theories claim that semantic representations are grounded in sensorimotor systems, but the contribution of sensorimotor brain areas in representing meaning is still controversial. One current debate is whether activity in sensorimotor areas during language comprehension is automatic. Numerous neuroimaging studies reveal activity in perception and action areas during semantic processing that is automatic and independent of context, but increasing findings show that involvement of sensorimotor areas and the connectivity between word-form areas and sensorimotor areas can be modulated by contextual information. 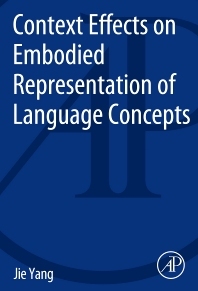 Context Effects on Embodied Representation of Language Concepts focuses on these findings and discusses the influences from word, phrase, and sentential contexts that emphasize either dominant conceptual features or non-dominant conceptual features.